I love Autumn and Winter, and fashion so it was only right that I took part in this challenge. I created two looks, one for me, and one for another blogger. I’m nominating Jess from Dungarees & Donuts, I hope you have fun creating your looks! 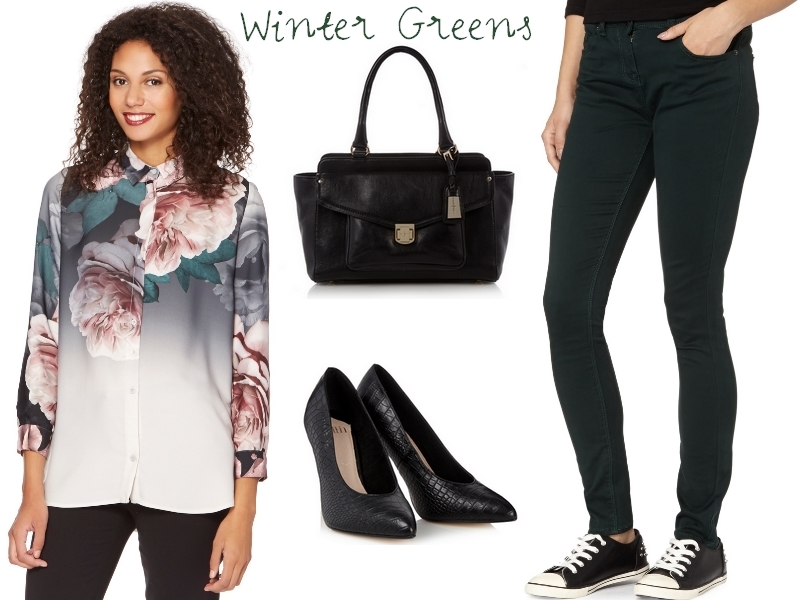 I went with the Winter Greens trend, as I fell in love with some of the clothes under the trend. Look One is for me and is the more dressy, party type look for Autumn and Winter. The main part of the look is The Collection Green Lace Art Deco Shift Dress. I just love the retro pattern on this dress, and thought it would be the perfect item of clothing to base the rest of my look around. I think it would go lovely with The Collection Dark Green Textured Reefer Jacket, for an arrival and departure from a lovely Autumn Winter party! Normally I would style this with a clutch bag, but I went for the Star by Julien Macdonald Designer Green Large Winged Tote Bag as you could also take this outfit from a day at work to night. Lastly I chose the Red Herring Black Lizard Print High Pointed Toe Court Shoes as they looked smart and stylish, especially with the dress. Look Two is for Jess and is the more smart casual look for Autumn and Winter. The main part of this look is the Betty Jackson. Black Designer Dark Grey Bloom Floral Shirt which I think is absolutely gorgeous! It is the perfect Autumn Winter staple for any woman’s wardrobe. This would go great with the Holly Superskinny Green High Rise Jeans to dress down the outfit slightly to make it more casual. To make it more smart-casual I added in the Faith Black Mock Croc High Court Shoes as they would dress up the outfit completely, it would be the perfect outfit to wear to a meal or a party where it isn’t formal dress. Lastly, I chose the J by Jasper Conran Designer Black Leather Twist Lock Pocket Shoulder Bag as it tops off the outfit and pairs it together so well. Remember you can enter the competition up until the 9th of October. Have fun entering!